The Old English Game Birds are a hardy and vigorous chicken breed. They are known for great longevity and will even easily turn to feral living. Size: Standard Male: 5 Ibs. / Standard Female: 4 Ibs. / Bantam Male: 24 oz. / Bantam Female: 22 oz. Comb, Wattles & Earlobes: The Old English Game have a small single comb with five points that stand upright. Small, thin, smooth wattles and earlobes. All are bright red, unless otherwise noted. Show people often dub (remove) comb, wattles, and earlobes for show. Barred: Beak is horn streaked with slate and the eyes are reddish bay. Shanks and toes are white with a little slate. Standard barred plumage. Birchen: Comb, wattles, and earlobes are mulberry and the beak, eyes, shanks, and toes are all black. Standard Birchen plumage. Black: This Old English Game has a comb, wattles, and earlobes that are red and the beak is black. The eyes are dark brown and the shanks and toes are black. Standard black plumage. Black-Breasted Red: The beak is light horn and the eyes are red. The shanks and toes are white with a little pink. Standard black-breasted red plumage. Black-Tailed Buff: The beak is a light horn and the eyes are red. The shanks and toes are blue and the plumage is primarily buff. The tail is black with some buff lacing. The wings are mainly buff with some black. Black-Tailed Red: This Old English Game has a beak that is a light horn color and the eyes are red. The shanks and toes are blue and the plumage is primarily red. The tail is a deep black and the wings are mainly red with some black. Black-Tailed White: The beak is a light horn and the eyes are red. The shanks and toes are white and the plumage is primarily white to a silvery white. The tail is black with some white lacing and the wings are mainly white with some black. Blue: The beak is dark horn to black and the eyes are dark brown. The shanks and toes are black. The plumage is standard blue. Blue Brassy Back: The beak is black and the eyes are brown. The shanks and toes are blue. Male: The head, hackle, and saddle are golden brass with a blue stripe down the center of each feather. The back is a medium golden color and the tail is a medium blue. The wings are in shades of blue highlighted with golden brass. The front of the neck, breast, body, wings, tail, and legs are blue with dark blue lacing. Female: The head and the front of the neck are blue tinged with brass. The hackle is dark blue and the breast is golden buff. The body and legs are blue with some buff. The tail and wings are medium blue with some darker blue lacing. Blue-Breasted Red: This Old English Game has a beak that is horn and the eyes are red. The shanks and toes are a pinkish white. Male: The head is light orange and the hackle and saddle are golden red. The back is rich red and the front of the neck, breast, body, legs, and tail are blue. The wings are blue with red and bay highlights. Female: The head is orangey red and the hackle is light orange with a blue stripe down the middle of each feather. The front of the neck and breast are light salmon to ashy gray as it blends with body feathers. The body, wings, legs, and tail are bluish gray blotted with brown, with gives an overall effect of drab brown. Blue Golden Duckwing: The beak is light horn and the eyes are red. The shanks and toes are white. Male: Mainly blue, with cream-colored head and hackle, gold back, and golden highlights on wings and tail. Female: Primarily shades of gray, with salmon front of the neck and breast and black highlights on the tail. They also have dark brown highlights on the wings. Blue Silver Duckwing: The beak horn streaked with slate and the eyes are red. The shanks and toes are white tinged with pink. Male: The head is white with silvery white hackles and back. The front of the neck, breast, and body are blue. The tail and wings are highlighted in silvery white. Female: Primarily shades of silver to light gray with a salmon front of the neck and breast. They have a blue tail with gray highlights and blue and gray wings. Blue Wheaten: The beak is horn and the eyes are red. The shanks and toes are white with a little pink. Male: The head is light orange and the hackle and saddle are golden red. The back is a rich red and the front of the neck, breast, body, legs, and tail are blue. The wings are blue with red and bay highlights. Female: Primarily shades of light creamy wheaten. Tail and wings are light wheaten with blue highlighting. Brassy Back: The beak is black and the eyes are brown. The shanks and toes are blue to black. Male: The head and saddle are brassy with a black stripe down the center of each feather. The hackle is black edged with brass and ending in a black spangle. The back is brass and the front of the neck, breast, body, wings, tail, and legs are black to a shiny black. Female: The head and neck are all black to black tinged with brass. The breast is light brassy salmon and the stern is brassy. The remainder is chocolate to chocolatey black. Brown Red: The comb, wattles, and earlobes are a mulberry color, while the beak is black. Their eyes are a dark brown and the shanks and toes are all black. They have standard brown-red plumage. Buff: This Old English Game has a beak that is horn and the eyes are red. The shanks and toes are white with a little pink. They have standard buff plumage. Columbian: The beak is light horn and the eyes are red. The shanks and toes are white. They have standard Columbian plumage. Crele: This Old English Game has a beak that is light horn and the eyes are red. The shanks and toes are white with a little pink. They have standard crele plumage. Cuckoo: The beak is horn and the eyes are red. The shanks and toes are white tinged with pink. They have standard cuckoo plumage. Fawn Silver Duckwing: The beak is light horn and the eyes are red. The shanks and toes are white with a little pink. Male: The head is white and the hackles and back are silvery white. The front of the neck, breast, and body are fawn and the tail and wings are highlighted with silvery white. Female: They have primarily silvery shades of fawn with some gray mixed in. The front of the neck and breast is a pale salmon color. The tail is fawn with gray highlights and the wings are blue and gray. Ginger Red: The beak is horn and the eyes are red. The shanks and toes are slate. They have standard ginger-red plumage. Golden Duckwing: The beak is horn and the eyes are red. The shanks and toes are white tinged with pink. They have standard golden duckwing plumage. Lemon Blue: The comb, wattles, and earlobes are mulberry, while the beak, eyes, shanks, and toes are all black. Standard lemon-blue plumage. Mille Fleur: The beak is horn and the eyes are reddish bay. The shanks and toes are slate. They have standard Mille Fleur plumage. Mottled: The beak is horn streaked with slate while the eyes are red. The shanks and toes are white mottled with black in young birds and leaden blue in older birds. They have standard mottled plumage. Quail: The beak is horn shaded with gray and the eyes are brown. The shanks and toes are blue. The head, hackle, back, saddle, and wings are black laced with golden bay. The front of the neck, breast, body, and legs are brownish yellow and the tail is black. Female: The head is chocolatey black tinged with yellow and the neck is black laced with golden bay. The front of the neck, breast, and body are brownish yellow laced with a lighter shade of the same color. The tail and wings are chocolatey black laced with light brownish yellow. Red Pyle: The beak is horn and the eyes are red. The shanks and toes are white with a little pink. They have standard red pyle plumage. Self Blue: This Old English Game has a beak that is a dark horn and the eyes are red. The shanks and toes are white tinged with pink. They have standard self blue plumage. Silver Blue: The comb, wattles, and earlobes are mulberry and the beak is black. The eyes are dark brown and the shanks and toes are all black. The head is silvery white and the hackle is a blue laced with silvery white. The front of the neck and breast are a slaty blue laced with silvery white. Male: The back is a silvery white and the saddle and upper breast are blue laced with silvery white. The lower breast, body, and legs are a slaty blue. The wings are dark blue forming a distinct bar across the wing. The primaries, secondaries, shoulders, and fronts are dark blue laced with darker blue. The bows are dark blue laced with white. The tail is dark blue. Silver Duckwing: The beak is horn and the eyes are red. The shanks and toes are white tinged in pink. They have standard silver duckwing plumage. Splash: The beak varies from dark horn to black and the eyes are a reddish bay color. The shanks and toes are pinkish white. They have standard splash plumage. Wheaten: The beak is light horn and the eyes are red. 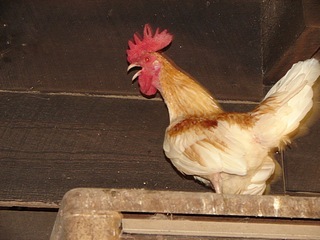 The shanks and toes are white tinged with pink. They have standard wheaten plumage. White: The beak is light horn and the eyes are red. The shanks and toes are white tinged with pink. They have standard white plumage. Special Qualities: They are very hardy and vigorous and known for their longevity. They will even easily revert to feral living. The Old English Game Bird evolved directly from the English cockfighting birds of old. Cockfighting was outlawed in England in 1849, but these birds persisted. The Old English Game is an very old breed and even believed to be the first breed that was developed in England. The oldest ancestors of the breed are believed to have even predated Julius Caesar's conquest of the British Isles that took took place around 55 BC. The Old English Game Birds of today still reflect the personalities of their ancestors in many ways. They have a feisty personality and roosters need to be separated to prevent fights to the death. The chicks, which matter slowly, often begin fighting at a young age. The Old English Game are a small bird that are very active, and hardy. They are good foragers and tend to fend for themselves. They are noisy and don't tend to do well in confinement. They are also good fliers and will often roost in trees if given the opportunity. The Old English Game dresses out well for a small bird and the hens lay well for a game bird. The hens are excellent mothers and are often used as foster mothers for other breeds. The Old English Game was first admitted into the APA in 1938.